SylK's Playground: Why don't I know Tatsumi Orimoto!!!!!! Why don't I know Tatsumi Orimoto!!!!!! 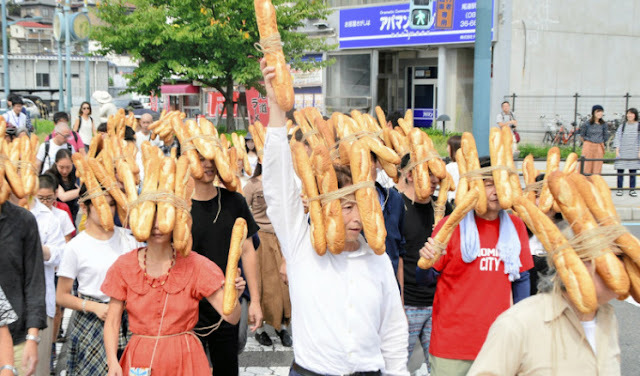 Performance Artist Tatsumi Orimoto, better known as 'Bread Man', 71 years old and still performing. Last month in Hiroshima, an 'All bread matters' protest. It looks cool! "In the early 70s Orimoto spent time in New York working as Nam June Paik’s assistant and taking part in the Fluxus movement and the performance art pieces of John Cage, Yoko Ono and Joseph Beuys. Around 1991 a defining moment for Orimoto occurred when he learned that in the Bible ‘bread means body.’ That’s what gave him the idea for Bread Man. “If Marcel Duchamp could call a toilet a fountain then bread means not food: it is sculpture.”"